The Medline Excel Kidz Pediatric Wheelchair is a child's manual wheelchair designed for use by children with mobility disabilities. 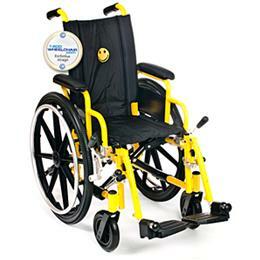 The Kidz chair comes standard with a dual axle and is available in 12-inch or 14-inch widths. The nylon upholstery is breathable nad features a simley face logo. Swing-back arms with arm release and padded andupholstered armrests make this one of the most comfortable pediatric wheelchairs on the market. Swing-away, detachable footrests are standard but elevating leg rests are available with tick, comfortable calf pads. Overall Width 19" - 21"
Seat Dimensions 12" - 14"
Folded Width 11" - 11.3"
Seat to Floor Height 15.5" - 16.5"